But what I can tell is that the guitar is tuned into the tuning of EADF#BE - among some guitarplayers known as the "renaissance" tuning. This tuning makes it possible to play in a rather rare key for guitarplaying, the b minor, in which I'm playing "Dark Patterns". In the normal EADGBE guitar tuning you would usually avoid playing in B at all, and even when you are playing in the E major or e minor keys I guess most players also have experienced how kind of boring it is that the B7 is the common choice to use for the dominant chord for the E key. In this "renaissance" tuning you just tune down the 3rd string G to F# which is the dominant for B and on top of the very nice middletone-sound you achieve you also get the possibility of playing in the key of b minor as your main key. As an extra achievement it's also a nice tuning for playing in the keys of E, A and D.
The harmonies are changing under the main theme, the A theme - from an "empty" chord with no third in the two first verses to a minor b chord from the third verse. The patterns are mainly being produced with the right hand. 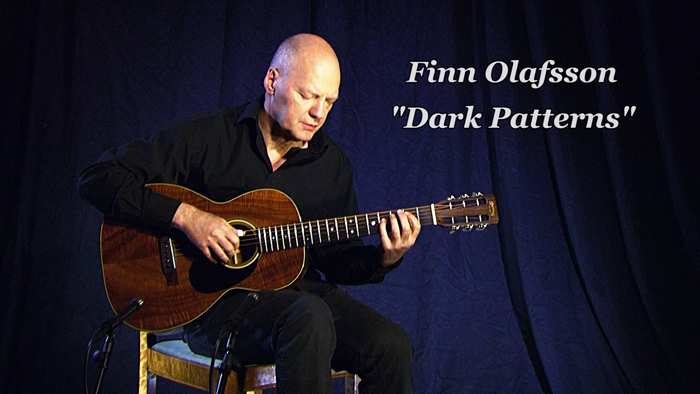 A "pattern" is the way of striking the guitar strings in repeated patterns. In this tune it's often done in the normal "p i m a" way - starting with you thumb, the "p", on the 6th, 5th and 4th strings, the "i" for the third string string, the "m" for the 2. string and the "a" for the 1st string. But sometimes it's nessesary to move the "p" up to the 3rd string and to move the "i" down to the 4th string. You can watch this on the video. The groove and rhythmical steadiness is very important for this tune. When I'm playing it I almost have the feeling of playing together with a bass and drums backing group. Finally: You may have noticed that I use many arpeggios and "rollings" as I often call them. You'll hear these especially towards the end of the tune. 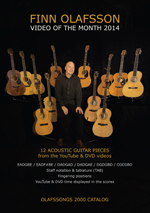 German acoustic guitar magazine "Akustik Gitarre" (5-2014) carries a guest-workshop of "Dark Patterns". 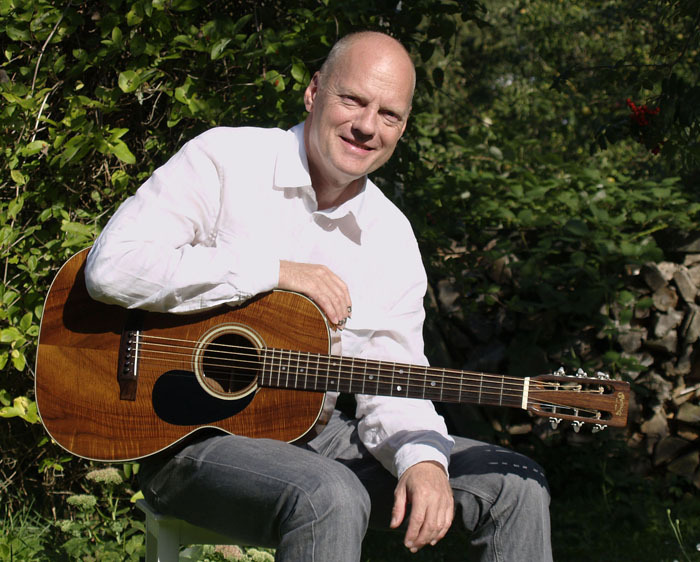 The workshop is an introduction to how to play the guitar tune yourself - as well as an introduction to the EADF#BE guitar tuning. The workshop was translated into German by editor Andreas Schulz. 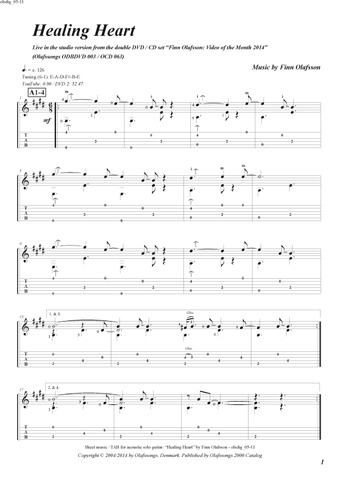 In the magazine you will find the sheet music and the tabs for the intro and A-part. They correspond to the recording on the "Begleit-CD", which, as well as the magazine, can be ordered from the magazine's website. Both also correspond to the video on YouTube. Many blues musicians find small guitars made of Hawaiian Koa very well suited for their style of music and the playing of it. Especially guitars with Koa 'all over' meaning not only the back and sides of the guitar should be Koa but also the top of the guitar should be made of the same wood. The voice of such a guitar is quite mellow but I hear a lot of everything in this guitar: Bass, mid range and treble. This C.F. Martin Custom 00-12 fret Koa (00-25) was ordered by an American blues musician and delivered from the Martin Custom Shop in 1985. Some years later he sold the guitar and it was bought by a Dutch collector, a noble baron, who kept it for some years in his collection. 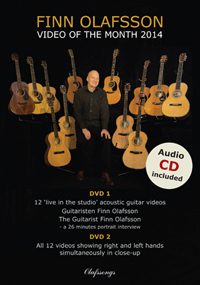 In 2008 the baron decided to sell it to The Fellowship of Acoustics in Holland - the leading shop of vintage and high end acoustic guitars in Europe. 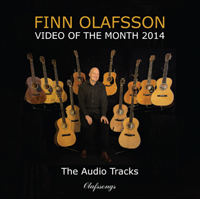 It was sold from The Fellowship of Acoustics to a Danish collector and dealer from whom I bought the guitar in 2009. "Very rare custom Koa from the 1980s, Serial # 471766. We are fortunate people since off and on, something very rare crosses our path like this Martin 00 12 fret custom in pristine condition. Flamed Hawaiian Koa for back, sides, and top, mahogany neck, slotted headstock with 3-on-a-plate tuners, ebony fingerboard and belly bridge, based on style 25, just in between style 21 and style 28, with black binding, 4 ply black and white purfling on top soundhole rings in 5-9-5 groupings chain-link back strip, dark stained top, well-loved and well played for thirty years after it left Nazareth. It has aged well, and sounds exceptionally good. The sound of an old Koa 12 fret guitar is unmistakable refined with a dry character, articulates very well, every tone is well defined, and just right, with a sweetness in every single tone typical for Koa only. With 47.5mm or 1 7/8" nut width and 635mm or 24.9" scale."